Saturn will shine near the moon in the predawn sky of Friday, Jan. 16, 2015. 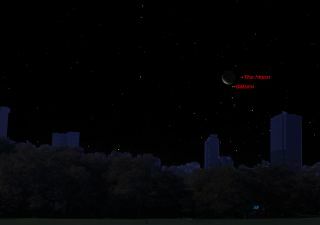 This sky map shows the location of Saturn and the moon as they will appear at 5 a.m. local time. Early Friday morning, if skies are clear, you have a good chance to catch sight of a lovely waning crescent moon pairing off with the ringed wonder of the solar system: the planet Saturn. Start looking low toward the east-southeast horizon around 3:30 a.m. your local time Friday (Jan. 16). Soon after the crescent moon — 21 percent illuminated — emerges from beyond the horizon, you’ll notice a bright non-twinkling yellow-white "star" shining sedately almost directly below it. By the break of dawn, Saturn will appear about 1.1-degrees below and a bit to the right of the moon. The apparent width of the moon is roughly equal to one-half of a degree, so Saturn will appear just over two moon widths from the moon itself. In order to see the famous rings of Saturn however, you'll need a telescope magnifying at least 30-power. Their north face is now tilted more than 24.7 degrees to our line of sight. The rings have not been so inclined since late June 2004. Saturn is currently 977 million miles (1.56 billion kilometers) from Earth. On the other hand, the moon is more than 4,100 times closer to Earth, at a distance of 235,300 miles (378,700 km). There is another striking target in the Friday predawn sky for the eagle-eye observer. The 1st-magnitude reddish star Antares will be shining 10 degrees (the equivalent of the width of your clenched fist held out at arm's length) to Saturn's lower left. Saturn appears to glow about 0.4 magnitude brighter than Antares. Currently Saturn lies within the head of Scorpius, the Scorpion, which resembles a "fence" of 2nd and 3rd magnitude stars. Saturn is still about four months from opposition and as such will continue to slowly grow in prominence in the days and weeks to come. Editor's note: If you capture a striking photo of Saturn and the moon, or any other night sky view, and you'd like to share it Space.com for a story or gallery, you can send in images and comments to managing editor Tariq Malik at: spacephotos@space.com.